Why is Taking Folic Acid so Important? Everyone needs folic acid. It helps red blood cells form and grow as well as makes and repairs DNA. For prenatal care, taking folic acid is essential for the growth of the spinal cord in the womb. 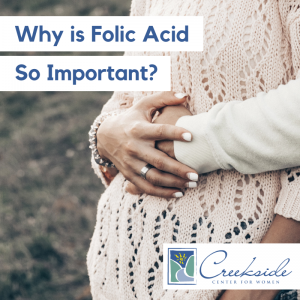 Because the spinal cord is one of the first parts of the body to form, it’s important that a woman consumes enough folic acid prior to and during the earliest stages of pregnancy. Taking folic acid helps to prevent miscarriage, birth defects such as spina bifida (the fetus’s spine and back do not close). Folic acid is also used to prevent anemia and help the bowel to absorb nutrients properly. For people with kidney disease, taking folic acid lowers homocysteine levels. Studies also have shown that taking folic acid helps to prevent age-related diseases, such as memory loss, age-related hearing loss, age-related macular degeneration, osteoporosis, etc. A folate is a form of the water-soluble B vitamin that occurs naturally in food (see a list of folate-rich food below). Folic acid is the synthetic version. Because folic acid is water-soluble, your body uses folic acid quickly, so your body needs folic acid each day to work properly. All women who are pregnant or planning to become pregnant should consume more folic acid. Women over the age of 14 years should take 400 micrograms (mcg) per day, and this should increase to 600 mcg from fortified foods or supplements during a pregnancy. Women should start taking folic acid at least three months before getting pregnant and during the first month following conception. While lactating, women should take 500 mcg of folic acid. Are there side effects associated with taking folic acid? Most adults do not experience any side effects when used in doses less than 1000 mcg daily. Some people report an upset stomach. Take folic acid with food to help prevent that discomfort. Dark green vegetables such as leafy vegetables (spinach, broccoli, and lettuce), Brussels sprouts, okra, asparagus, are good sources of folic acid. Be aware that overcooking can reduce the folate content. The following foods are also known to be rich in folic acid: leafy vegetables and fruits (such as kiwi, bananas, melons, and lemons), lentils, cabbage, egg yolk, whole-wheat bread, milk, mushrooms, liver (women should not eat liver during pregnancy), oranges and orange juice. If you have questions about prenatal care, we invite you to visit our website at https://creeksideobgyn.com/obstetric-services/pregnancy-prenatal-care/ and to make an appointment with our team. Call 479.582.9268 to schedule a visit. To learn more about folic acid, visit https://www.womenshealth.gov/a-z-topics/folic-acid.